The Philippine Atmospheric, Geophysical and Astronomical Services Administration (PAGASA) announces the new potential cyclone that might enter the PAR and make landfall over Mindanao this weekend. 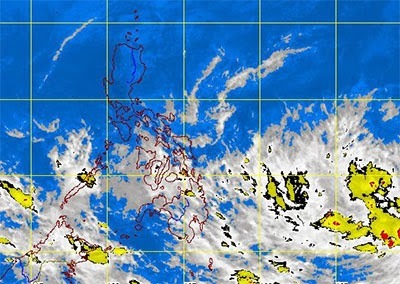 PAGASA expected the low-pressure area to enter the Philippine area of responsibility on Friday, January 10. The weather advisory as of 5 a.m. today, January 9, "Trough of a Low Pressure Area (LPA) affecting Mindanao. Northeast Monsoon affecting Luzon." PAGASA said if this new and first LPA for 2014 becomes a cyclone while inside the PAR, it will locally codenamed "AGATON." PAGASA added that the moderate to strong winds from the northeast will prevail over northern Luzon and the eastern sections of Luzon and of Visayas. The coastal waters along these areas will be moderate to rough. For the meantime, please bookmark this page now or visit this site more often for you to be updated. You may also share this post to your friends so they may know about the first and new LPA for 2014. Comments or suggestions about "New LPA may become first Cyclone on 2014" is important to us, you may share it by using the comment box below.